How do actors learn their lines? It’s not the same act of memorizing that we perform as students when we commit to memory the steps of photosynthesis for a biology midterm. Actors learn lines to repeat them over and over in performance after performance, and yet must do so as if they have never spoken them before, to create “the illusion of the first time” (Stanislavsky qtd. in Strasberg 35). Earlier this semester, I managed to learn lines for a play and repeat them in six performances, but I still don’t know how I did it. In fact, it was only after the play closed that I could bring myself to count the words. I was curious to know how many I’d memorized, but if I had counted them before I’d learned them, the process of memorizing would have been too daunting. And counting them during the run of the play could have undermined my performance; dwelling on how many words I was keeping in my head might have made me more prone to forget. So how did I learn those 1,567 words and remember them? My fascination with learning lines—and admittedly, my anxiety about the possibility of forgetting—led me to research the process. I found that teachers of acting tend to downplay memorizing lines. In fact, the most influential acting teachers of the twentieth century spoke rarely on the subject in their lectures. Though it’s essential to the craft—actors can’t read from their scripts or call “line, please” in performance, after all—it isn’t a focus of instruction. Still, it’s a process worthy of our attention because of what it may reveal about memory and how line-learning may benefit our cognitive health. Notably, the texts that Adler asked her students to paraphrase aren’t scenes. Kahlil Gibran’s The Prophet isn’t a play but a collection of prose-poem essays. By choosing lines that her students would never perform in a play, Adler emphasized to them the importance of understanding the words on the page rather than the act of rote memorization. Like Adler, Lee Strasberg instructed his students (including James Dean, Marilyn Monroe, and Paul Newman) to study texts that they wouldn’t perform. But rather than assigning them the prose-poems of The Prophet, as Adler did, Strasberg required his students to read short stories, among them Ernest Hemingway’s “Hills Like White Elephants.” Strasberg chose short stories over scenes because the conversations are often more realistic than the dialogue of plays, which, as Strasberg remarked, include “elements that characters would never say but convey necessary information to the audience” (161). Strasberg also found short stories useful teaching tools because “the short-story material forces the actor to really find out what he is talking about, not just what he is saying, and to find out how that relates to what the scene is all about” (161). What Sandy did is begin to examine the fact that dialogue is the last thing that happens, at any time, between two people. It’s all supported by behavior and attitudes. You say something. You mean a certain thing to me when I see you because of whatever relationship we may have. You say something. I hear it. Depending on the state I’m in when I came into the room, it means something to me. It produces a reaction in me emotionally, and the last thing that happens is that I respond with dialogue. I didn’t know that I was following Hagen’s instruction when I asked a hair stylist to cut off seven-eighths of my hair or when I asked a seamstress if she could help me solve a head-scarf problem. 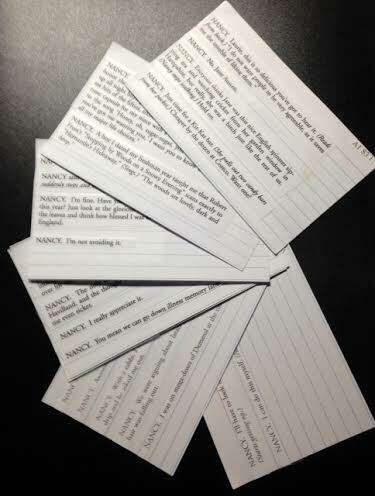 My instinct simply told me that I needed to make my character, Nancy Gordon, as real as possible. That meant figuring out how to keep scarves on my head in the fall and winter of Act One, when she’s hiding her hair loss from chemotherapy, and cutting my hair for her appearance in the spring of Act Two, when her hair has started to grow back. In the first weeks of rehearsal, I simply tied my Act-One scarves over my hair, which I was then wearing in a ponytail (I hadn’t cut it yet), and they repeatedly came undone and fell off on stage. Can you sew these so they appear to be simply tied? I asked a seamstress. They keep falling off on stage, and I need to make sure that doesn’t happen. More importantly, I realized that I needed not to worry about the scarves. Doing so would take me out of the scene. On stage, I had to be Nancy, not myself, wondering if my scarf was about to slip and fall. The seamstress said yes. She could sew the scarves’ knots for me. 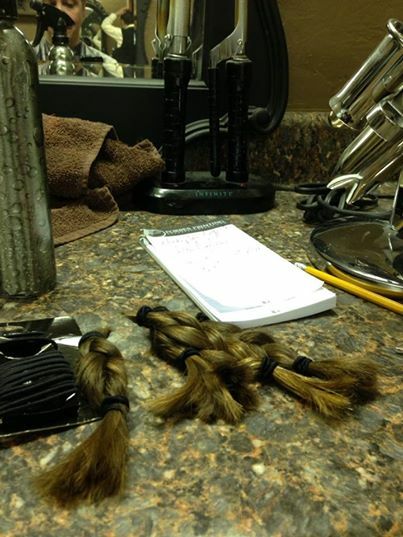 But if I do it now, she added, the scarves will be too loose after you cut your hair. So I went back to see her after I cut my hair. I tied on each scarf as tightly as possible, and she sewed the knots. Wearing them with their knots sewn and with double-sided tape securing them at my temples solved the problem. That head-scarf problem and the seamstress’ solution are details I offer not as digression but as an example of the “particularizations” that Hagen instructs her students to make. With a scarf secured tightly—fused to my head, it seemed—I was Nancy Gordon in a way that I hadn’t been before. She was more real. But I still don’t understand how a particular such as a scarf or a haircut makes “much of what you have to say [. . .] inevitable” (Hagen 117). Still, I know that it was part of the process that transformed me into the character who spoke the words I spoke. But why should anyone who isn’t an actor care about this? you may ask. Simply put, the answer is cognitive health. Though we aren’t all actors, we all experience diminished memory as we grow older, and cognitive research that explores the memorization process specific to acting indicates that it may improve our memory and other cognitive functions. The research team of Helga and Tony Noice—she a cognitive psychologist and he a director and actor—have studied acting and its cognitive effects for more than twenty years. In “What Studies of Actors and Acting Can Tell Us about Memory and Cognitive Functioning,” the Noices address the process of learning lines—specifically memorizing large amounts of dialogue in a short period of time—and how actors reproduce those lines verbatim with spontaneity. Applying that process to other activities, including learning techniques for undergraduates and memory improvement in older adults, they conclude that the essence of acting—what the Noices term active experiencing or AE—may enhance memory (17). So should we enroll in acting classes to improve our cognitive skills? The Noices findings certainly make a case for it, especially when you consider that the acting classroom may be one of the last places where students are required to commit words to memory. In the information age, it’s far more important to develop our critical thinking skills. We don’t need to memorize what’s available at our fingertips, but we need to be able to distinguish the credible information from the dreck. And if the act of memorizing really does improve our cognitive health, perhaps we should look to the stage as a place to do it. I hope to return there, myself. But if I do, don’t ask me how many lines I have to learn. I won’t count them until the play closes. Adler, Stella. The Art of Acting. Ed. Howard Kissel. New York: Applause, 2000. Print. Hagen, Uta. A Challenge for the Actor. New York: Scribner’s, 1991. Print. Hanc, John. “Elderly Acting Might Just Improve . . . Line, Please!” NYTimes.com. The New York Times, 9 Sept. 2013. Web. 24 Apr. 2014. Noice, Helga, and Tony Noice. “What Studies of Actors and Acting Can Tell Us about Memory and Cognitive Functioning.” Current Directions in Psychological Science 15.1 (2006):14-18. Academic Search Complete. Web. 10 Apr. 2014. 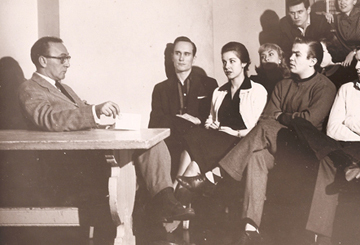 Sanford Meisner: The American Theater’s Best Kept Secret. Dir. Nick Doob. Perf. Robert Duvall, Joanne Woodward. YouTube.com. YouTube, 18 Nov. 2006. Web. 12 Apr. 2014. Strasberg, Lee. 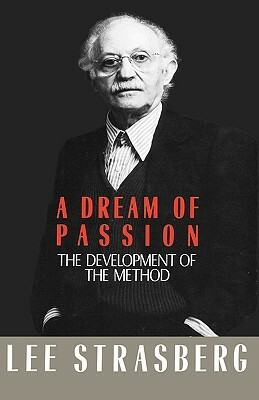 A Dream of Passion: The Development of the Method. Ed. Evangeline Morphos. Boston: Little, Brown, 1987. Print. When I began work on the paper that I’m writing as a model for my students’ Unit III essay, I didn’t plan to compile an annotated bibliography of potential sources. I did, however, write one bibliographic entry as part of the preliminary work that I shared with them. When we looked at the sample entry in class, I told them that I wrote it because all of its elements would appear in some form in my paper. In other words, I told them, if you know you will need to write a works cited entry for your source, why not go ahead and write it? If you know you will need to summarize your source, why not go ahead and write a summary? And so on. Still, I wrote the one bibliographic entry, thinking I would move on to more general note-taking afterward. But I found myself returning to the process of summarizing each source. I realized that what I recommended to my students as a useful but optional step was essential to my own process, at least in the case of this paper. A couple of the summaries are the welcome result of a problem I encountered with two of the books, namely no index. Without an index, I couldn’t simply turn to the pages where the authors, both acting teachers, specifically address the subject of learning lines. Instead I was forced to engage in a form of concentrated skimming, reading portions of every paragraph for mentions of line-learning or memorization. My careful study of those two books—and of a third that did include an index—enabled me to produce general summaries as well as notes specific to my subject: learning lines. The bibliography that follows brings together the insights of four of the most influential acting teachers of the twentieth century, in books by Stella Adler, Uta Hagen, and Lee Strasberg; and in a documentary film on the life and career of Sanford Meisner. It also includes an academic article chronicling research on line-learning and cognitive function. Founder of the Stella Adler Studios in New York City and Los Angeles, Adler—considered one of the most influential teachers of acting—taught both Marlon Brando and Robert Deniro. 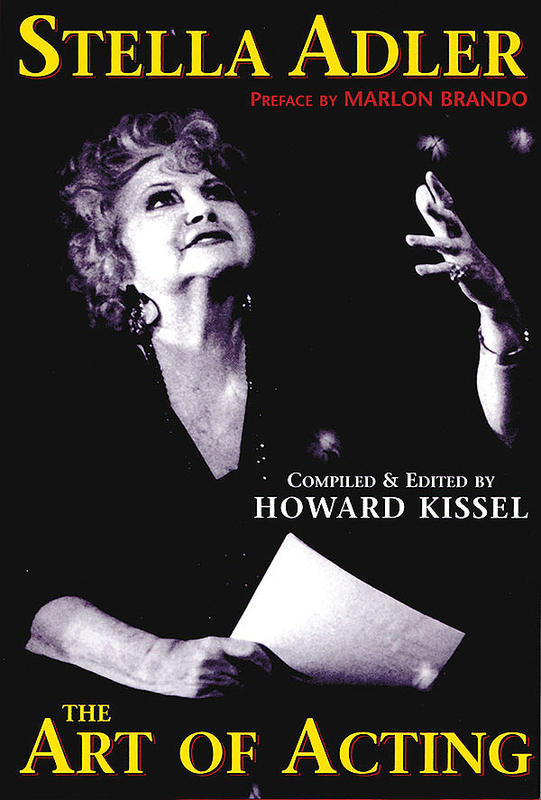 Her writing on the craft includes The Technique of Acting (1988) and Stella Adler on Ibsen, Strindberg, and Chekhov (2001). Uta Hagen originated the role of Martha in the Broadway production of Edward Albee’s Who’s Afraid of Virginia Woolf and later became of the most distinguished acting teachers of the twentieth century. At the Herbert Berghof Studio, she taught, among others, Al Pacino, Jason Robards, and Jack Lemon. 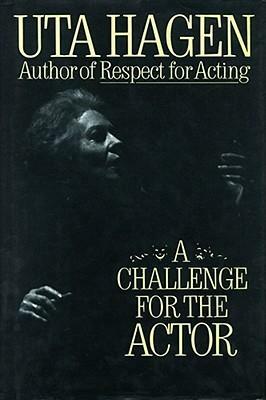 Her books on acting include Respect for Acting (1973) and A Challenge for the Actor (1991). In “What Studies of Actors and Acting Can Tell Us about Memory and Cognitive Functioning,” Helga and Tony Noice address the process of learning lines—specifically memorizing large amounts of dialogue in a short period of time—and how actors reproduce those lines verbatim with spontaneity. Applying that process to other activities, including learning techniques for undergraduates and memory improvement in older adults, they conclude that the essence of acting—what the Noices term active experiencing or AE—may enhance memory. Helga Noice, a Professor of Psychology at Elmhurst College, researches acting and memory. Her current study of memory training in older adults receives funding from the National Institutes of Health. Tony Noice, an adjunct member of the theater faculty at Elmhurst College, co-authored with his wife, Helga Noice, The Nature of Expertise in Professional Acting: A Cognitive View (1997). Hailed as one of the American theatre’s most influential teachers (along with Stella Adler and Lee Strasberg), Sanford Meisner joined the faculty of the Neighborhood Playhouse School of the Theatre in 1935 and later served as the Director of its Acting Department. His students at the Neighborhood school include actors Robert Duvall, Tony Randall, and Joanne Woodward, as well as director Sydney Pollack and playwright David Mamet. A Dream of Passion chronicles Lee Strasberg’s training with Richard Boleslavsky, a student of Constantin Stanislavsky’s, and details Strasberg’s application of Stanislavski’s system to his work in both the Group Theatre (which Strasberg co-founded) and in the Actor’s Studio (for which he served as Artistic Director). Strasberg observes that the actor’s central problem lies in the fact that he knows what his character does not and cannot know: “Regardless of the skills with which the actor may pretend not to know what will occur next on stage, his normal scenic activity is actuated by his memory—by his carefully prepared and memorized words and motions” (107). The challenge for the actor then, Strasberg notes, is to recreate that experience believably not once but over and over for every performance, and “yet include what Stanislavski called ‘the illusion of the first time’” (35). To help his students understand the meaning of scenes—rather than simply memorizing their words—Strasberg required them to read short stories. He chose short stories over scenes from plays because the conversations are often more realistic than the dialogue of plays, which, as Strasberg remarks, include “elements that characters would never say but convey necessary information to the audience” (161). Strasberg also found short stories useful teaching tools because “the short-story material forces the actor to really find out what he is talking about, not just what he is saying, and to find out how that relates to what the scene is all about” (161). Considered the father of method acting in the United States—a system that revolutionized acting on the stage and screen—Lee Strasberg co-founded the Group Theatre (with Harold Clurman and Cheryl Crawford), served as Artistic Director for the Actors Studio, and founded the Lee Strasberg Film and Theatre Institute in New York City and Hollywood. His students include actors James Dean, Robert DeNiro, Marilyn Monroe, Paul Newman, and director Elia Kazan.